Happy Margarita Day Cinco de Mayo! I feel like this is probably the the biggest food holiday we’ve had in awhile. Everyone’s posting taco recipes, nacho recipes, guacs, salsas, churros, and of course, margaritas. I kinda wish I would have taken advantage of some of the Mexican desserts, like churros, or sopapillas, tres leches cake, Mexican brownies, or flan. Except flan is something I actually have no interest in making at all. But margaritas! 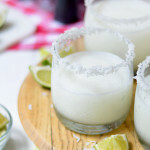 How could I not post a margarita recipe on Cinco de Mayo? And yes, there is wine in these. As much as I wanted to use a ton of fresh, juicy peaches for these margs, I just couldn’t find any. It’s still a little early for peaches. I was lucky enough to find a few a couple weekends ago, but it was nowhere near enough for a whole pitcher of margaritas. And today absolutely calls for a whole pitcher. So I went with frozen, sliced peaches. 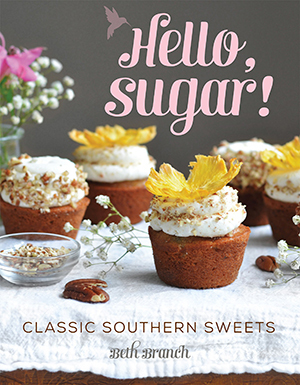 If you’re not into that, definitely wait for the good stuff to be in season and then makes these. 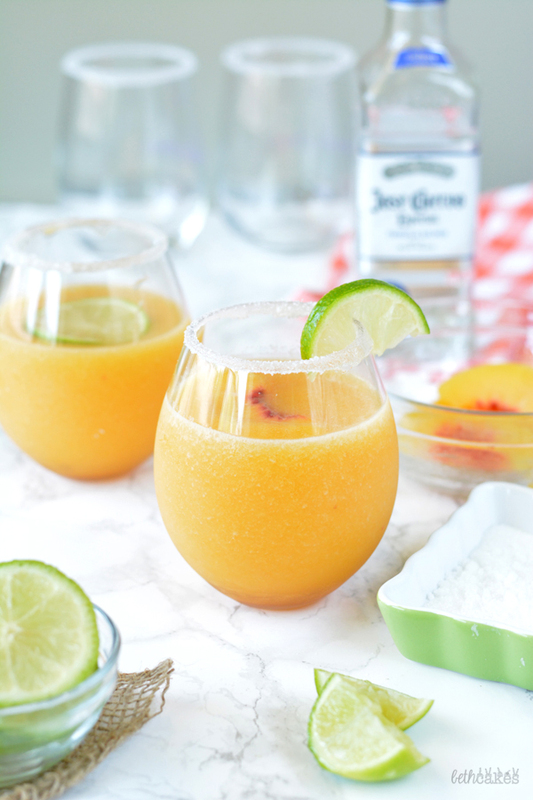 Because I kept the peaches a little bit frozen when I added them to my blender, these margs were basically boozy, peach slushies. If you’re going for “on the rocks,” I’d let the peaches thaw completely first. Aside from peaches, you’ll need some tequila, white wine, sugar and a little lime juice. I used Cupcake Moscato because it’s sweet and super bubbly. But go for your favorite white wine. You can always adjust the sugar to get the sweetness just right. I got the idea for these margs after having a white peach sangria swirled marg at Chuy’s forever ago. I always said I was going to try a homemade version of that, but I don’t know WHY it took me so long to get around to it. 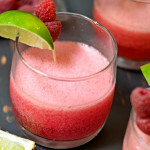 These are the perfect summer margs, y’all! Combine all ingredients in a blender and blender until smooth. 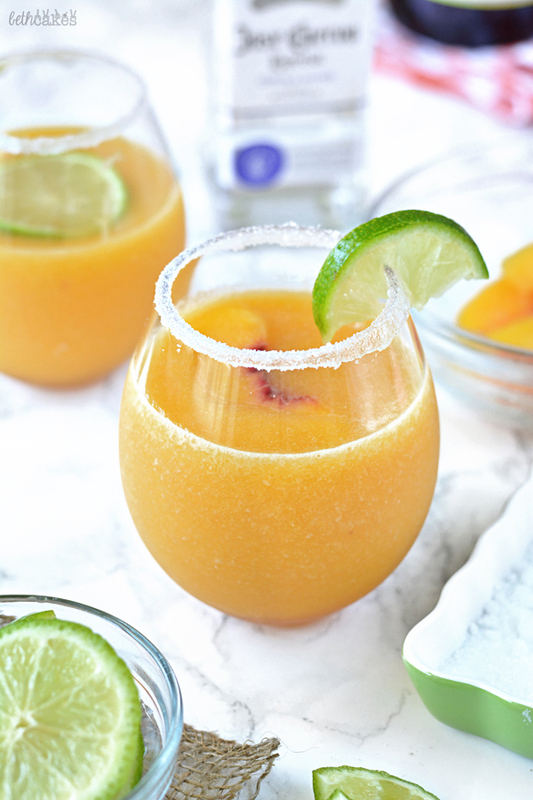 If you use frozen peaches, the margs will be thicker and slushy-like. 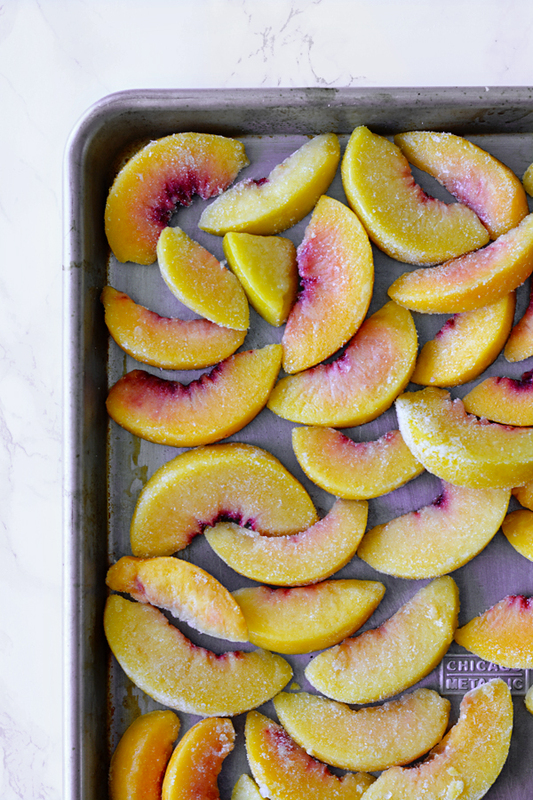 If you let the peaches thaw, or use fresh peaches, the mixture will be thinner. Both ways are delicious! Dip each glass in corn syrup and then in salt (or sugar). 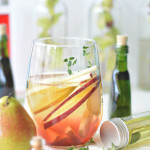 Pour margarita mixture into the glasses and enjoy! Wow! Looks perfect especially for Today! 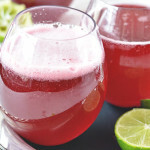 Sangria + Margarita = amazing!! I’ll take one for breakfast this morning. 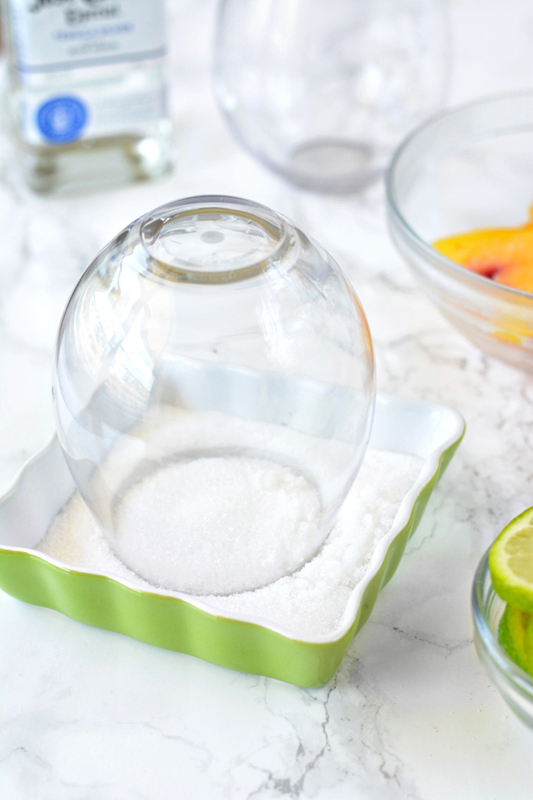 I love the idea of a boozy peach slushie! These look so good! Gorgeous! And I love that you added sparkling wine. 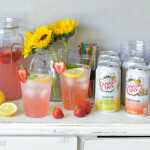 So refreshing and summery! This sounds so dangerously delishious. I want some. Margaritas are everything that’s right and good with the world. I’ll take two of these beauties. Pinned. OH MY! This looks FABULOUS, darling. 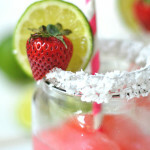 I love margaritas and this is wonderful refreshing version!!! Well done. 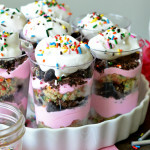 These look perfect, Beth! The color is gorgeous! I wish every day was Cinco de Mayo because margs and tacos and churros. I mean, so much good stuff!